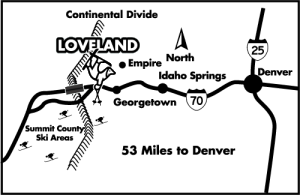 The Loveland Adventure Center located in the lower level of the Basin Sport Shop has the latest in skis, snowboards and tele equipment to test drive 7 days a week. Our unique programs allow you to demo multiple products on the same day. See below for a list of testing tips. • Our demos are tuned regularly and will be in top shape when you test them. • Season Pass & Loveland Pass Card Holders receive a discount on Hat Trick Demos! • A major credit card is required for deposit. • You are responsible for any damage or theft.